Fact: The History term "All-Terrain Vehicle" or ATV is used in a general sense to describe any of a number of small open motorized buggies and tricycles designed for off-road use. However, the American National Standards Institute (ANSI) defines an ATV as a vehicle that travels on low pressure tires, with a seat that is straddled by the operator, and with handlebars for steering control. By the current ANSI definition, it is intended for use by a single operator, although a change to include 2-seaters (in tandem) is under consideration. The rider sits on and operates these vehicles like a motorcycle, but the extra wheels give more stability at slow speeds. Although typically equipped with three or four wheels, six-wheel models exist for specialized applications. Engine sizes of ATVs currently for sale in the United States (as of 2008 products) range from 49cc to 1000cc and 49cc to 700cc for two stroke ATVs. 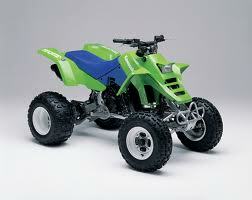 Four wheeled versions are most commonly called "quads," "four-wheelers" or "ATVs" in the United States and Canada, and "quad bikes" or "quad cycles" in other English-speaking countries. In Australia, ATVs are also known as "forbys", and in Israel can be called "Polarises" (After the company). Models with three wheels are typically known as "three-wheelers," and ATCs (or less commonly "All-Terrain Cycles" and "trikes"). ATVs can also be considered Off Highway Vehicles (OHV) or Off Road Vehicles (ORV), along with motorcycles. ATVs were made in the United States a decade before 3- and 4-wheeled vehicles were introduced by Honda and other Japanese companies. During the 1960s numerous manufacturers offered similar small off-road vehicles, that were designed to float and were capable of traversing swamps, ponds and streams as well as dry land. Typically constructed from a hard plastic or fiberglass "tub", they usually had six wheels - all driven - with low pressure (around 3 PSI) balloon tires, no suspension (other than what the tires offered) and used a skid-steer steering setup. These early amphibious models were the original all-terrain vehicles - or ATVs. Contrary to todays ANSI definition of an ATV, they were intended for multiple riders, sitting inside, and would usually have steering wheels or control sticks rather than motorcycle-type handle bars as stipulated in the current definition. Since the advent of three- and four-wheeled, straddled ATVs, these have more or less 'taken over' the term, leaving the 6x6 and 8x8 floating variety now mostly known as AATVs (Amphibious All-Terrain Vehicles). Current brands of these machines include Argo and MAX. Though not as fast as other ATVs, they can be operated with precision at slow speeds, and of course, have the ability to float. The spinning action of the tires is enough to propel the vehicle through the water, albeit slowly. Outboard motors can be added for extended water use. Honda made the first three-wheeled ATVs in 1970, which were famously portrayed in the James Bond movie, "Diamonds Are Forever". Dubbed the US90 and later - when Honda acquired the trademark on the term - the ATC90, it was designed purely for recreational use. Clearly influenced by earlier ATVs, it featured large balloon tires instead of a mechanical suspension. By the early 1980s, suspension and lower-profile tires were introduced. The 1982 Honda ATC200E Big Red was a landmark model. It featured both suspension and racks, making it the first utility three-wheeled ATV. The ability to go anywhere on terrain that most other vehicles could not cross soon made them popular with US and Canadian hunters, and those just looking for a good trail ride. Soon other manufacturers introduced their own models. Over the next few years, All manufacturers except Suzuki developed high performance two-stroke engined machines to compete against Honda's monopoly on the market, but did not sell as many due to the reputation already secured by Honda in the market. These models were the Yamaha Tri-Z YTZ250 with a 246-cubic-centimetre two-stroke engine, manual clutch and 5 or 6 speed gearbox, and also the Kawasaki Tecate KXT250 with a 249-cubic-centimetre two-stroke, 5 speed gearbox in both generations and a manual clutch. Suzuki was a leader in the development of 4-wheeled ATVs. 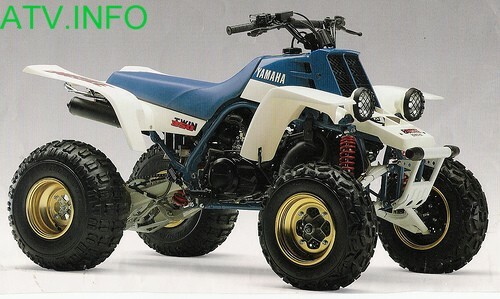 It sold the first ATV, the 1982 QuadRunner LT125, which was a recreational machine for beginners. 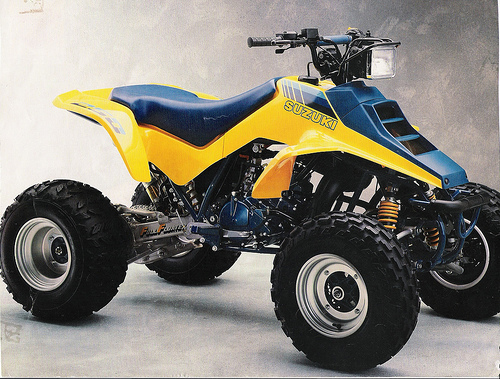 In 1985, Suzuki introduced to the industry the first high-performance 4-wheel ATV, the Suzuki LT250R QuadRacer. This machine was in production for the 1985-1992 model years. During its run, it underwent three major engineering makeovers. However, the major core features were retained. These were: a sophisticated long-travel suspension, a liquid-cooled two-stroke motor and a fully manual 5-speed transmission for 85-86 models and a 6-speed transmission for the 87-92 models. It was a machine exclusively designed for racing by highly skilled riders. Kawasaki responded with its Tecate-4 250. In 1987, Yamaha introduced a different type of high-performance machine, the Banshee 350, which featured a twin-cylinder liquid-cooled two-stroke motor from the RD350LC street motorcycle. Heavier and more difficult to ride in the dirt than the 250s, the Banshee became a popular machine with sand dune riders thanks to its unique power delivery. The Banshee remains hugely popular, but 2006 was the last year it will be available in the U.S. (due to EPA emissions regulations). In Canada, however, the Banshee will be back for the 2007 model year, still featuring the same parallel-twin, 350cc, two-stroke engine that made the machine famous. Models continue today to be divided into the sport and utility markets. Sport models are generally small, light, two wheel drive vehicles which accelerate quickly, have a manual transmission, and run at speeds up to 90 miles per hour (145 km/h). Utility models are generally bigger four wheel drive vehicles with a maximum speed of up to 72.5 miles per hour (104 km/h). They have the ability to haul small loads on attached racks or small dump beds. They may also tow small trailers. Due to the different weights, each has advantages on different types of terrain. Sport models are built with performance, rather than utility, in mind. To be successful at fast trail riding, an ATV must have light weight, high power, good suspension and a low center of gravity. These machines can be modified for such racing disciplines as motocross, woods racing (also known as hare scrambles, cross country), desert racing, hill climbing, ice racing, speedway, TT (Tourist Trophy), flat track, drag racing and others. Examples of high-performance models include the Yamaha YFZ450, Honda TRX450R,Suzuki QuadRacer R450, Kawasaki KFX450R, and Can-Am DS450. ATVs designed for fast trail riding include the Yamaha Raptor 700R/660R,Suzuki QuadSport Z400, Yamaha Warrior 350, Honda Sportrax 400EX, kawasaki kfx400,Bombardier/Can-Am DS650, Arctic Cat DVX400, Polaris Scrambler 500, Polaris Outlaw 500, Polaris Outlaw 525, Kawasaki KFX700, Polaris Predator 500 and Can-Am Renagade 800. Three wheel performance models include the Honda ATC250R, Yamaha Tri-Z YTZ250 and Kawasaki Tecate KXT250, All manufactured in the 80's. Three Wheelers designed for fast trail riding include the Honda ATC350X and the Honda ATC200X. If necessity was the mother of the first ATV, Honda engineer Osamu Takeuchi was its father. In 1967, American Honda asked Honda R&D Ltd. for a new product dealers could sell when motorcycle sales cooled off in the winter. Mr. Takeuchi was assigned to lead the project, along with a small group of Honda engineers. This was clearly the group for the job, since Takeuchi and company had been working to develop other new recreational vehicles that never saw production. These projects gave Takeuchi the tools to develop Honda's first ATV, the US90. Forget the proverbial blank sheet of paper. Takeuchi started in the shop with a head full of ideas and an eclectic assortment of components. Two-, three-, four-, five- and even six-wheeled configurations were examined, but the three-wheel concept delivered the best combination for the machine's intended mission. It dealt with snow, mud and assorted slippery conditions a two-wheeler couldn't, while providing more maneuverability than other configurations. In the early stages, a Honda ST(TM)70 motorcycle gave up its 70cc four-stroke single-cylinder engine for the cause, along with assorted chassis parts. An extended rear axle carried cultivator wheels designed to handle rough terrain. Two driving wheels in the rear worked well. Cultivator tires didn't. The biggest challenge would be finding a tire capable of getting a grip on soft, changeable terrain such as snow, sand and mud. Two wheels, three wheels, four wheels or more? Motorcycle tires weren't an option. The design process quickened when American Honda sent Takeuchi an American invention called the Amphi-Cat& that rolled on six 20-inch low-pressure, high-flotation balloon tires. The light bulb went on. Revamping his ST70-based prototype to accept the new low-pressure rolling stock, he went to work on his own tire design, ending up with a 22-inch tire inflated to 2.2 psi. With the tire dilemma solved, the 70cc engine lacked the muscle necessary to push a full-sized rider through snow or mud. A 90cc engine running through a special dual-range four-speed gearbox added the requisite flexibility over varied terrain. The next phase of development was optimizing the chassis to match the new engine and tires. Testing over rough roads, sand hills and slopes as steep as 35 degrees gradually established chassis dimensions effective for recreational riding as well as agricultural work. Laid out in the shape of an isosceles triangle with the footpegs located outside the triangle to optimize control, the ATC design was unique enough to let Takeuchi patent the arrangement. Exhaustive testing brought other lessons to light as well. Using a thumb throttle instead of the typical motorcycle twist grip let riders shift their weight for optimal vehicle maneuverability while maintaining precise throttle control. A rear differential was considered, but discarded when a live axle performed better. Though suspension is an integral part of the modern ATV, Takeuchi's original balloon tires soaked up rough terrain best by themselves. Exerting less pressure on soft or sensitive terrain than the average human foot, those tires let the vehicle go places others couldn't, leaving little or no evidence of their passing-an advantage that looms large in hundreds of modern ATV applications. Officially introduced to America in 1970, the US90 sent its 7 horsepower through a dual-range four-speed gearbox with automatic clutch, and sold for $595. It was renamed the ATC90 later that year as Honda trademarked the ATC name. Three models carried that Honda ATC monogram through the 1970s. 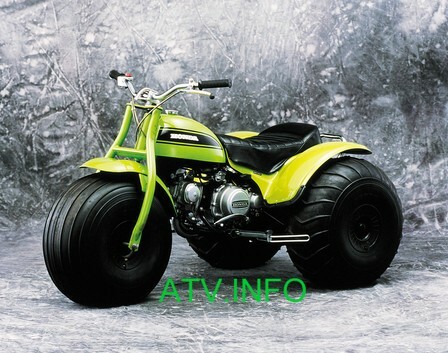 The ATC70 gave younger riders a scaled-down version of the fat-tire experience. And by the end of the decade, requests for more power turned the original ATC90 into the ATC110 in 1979. The ATC was as evolutionary as it was revolutionary from the beginning. Good as the original fat tires were on snow and sand, they were vulnerable to punctures from things such as stubble from harvested crops. The fact that those original tires weren't repairable compounded the problem, so a fabric carcass was added, and steel hubs replaced the first hubless wheel design in 1975. Tougher, color-impregnated plastic fenders were added in 1975 as well. Though it was primarily a recreational vehicle through the '70s, farmers were beginning to see the ATC as a tool to make their lives easier. Honda engineers followed their machines into the field, gathering data to guide the machine's natural adaptation to a rapidly growing market. The ATC was as capable at labor as at leisure, and America was catching on. percent of today's ATV market. Introduced in 1980, the ATC185 was popular among utility users. Rolling on larger, 25-inch tires that afforded improved traction, the 185 featured a five-speed transmission with an automatic clutch, and a 180cc four-stroke single-cylinder engine that was considerably more powerful as well. Though designed to split its duties more or less equally between work and play, the 185 set the stage for Honda's first purpose-built utility ATV two years later. The 1982 ATC200E, a.k.a. Big Red(R), had more of everything necessary to get a host of jobs done. Its 192cc engine and five-speed dual-range gearbox cranked out more power, especially low in the rev band, to make chores such as towing, spraying, seeding and fertilizing easier. An electric starter in addition to the standard recoil system made starting the day as easy as pushing a button. Dual racks and a 9.2-liter storage box made carrying tools, hay bales, fencing and other agricultural essentials easier. A new sealed rear drum brake survived the muddy fields and water crossings, and telescopic-fork front suspension made a day in the saddle that much more comfortable. Big Red added a reverse gear in 1984, and its drive chain was replaced with shaft drive for extra durability and less maintenance. The other major ATV theme of the '80s-racing-was being played out everywhere from frozen lakes in the East to Western deserts to the dirt ovals of Middle America. Racing was an essential part of Honda from its founding in 1948. Thus it became part of ATC vocabulary as well, and the introduction of the ATC250R in 1981 put the rest of the world on official notice that Honda was as serious about winning on three wheels as it was on two. The world's first high-performance two-stroke ATC adapted Honda's CR(R) motocross technology to the three-wheel world with predictable results, taking hordes of unsuspecting competitors by storm. Running unofficially in the 1980 Baja 1000 on pre-production ATC250Rs, a group of Honda associates surprised racing legend Mickey Thompson when they caught and passed him pre-running for the race. Honda's first official ATC racing participation came in the SCORE-sanctioned 1981 Parker 400 held in the Arizona desert. Thanks to Thompson's considerable influence, an official three-wheel class was sanctioned in the 1981 Baja 1000. In 1984, Honda's ATC250Rs started just behind the motorcycles rather than from the very back of the starting order, and then finished first and second in class, putting them fourth and fifth overall. Nothing on four wheels finished ahead of the ATCs. The three entries that did well were all large-displacement motorcycles, including Honda's race-winning XR(TM);. Honda raised the bar in 1985 with an all-new, liquid-cooled version of the 250R that cranked out 38 horsepower and offered nearly 10 inches of suspension travel at both ends, giving it the power to do disappearing acts ahead of other brands at race tracks across the country. Though it was never as successful in the desert as the more potent 250R, the ATC200X that debuted in '83 proved that Honda four-strokes could run with the best of them. The 200X combined a high-performance 192cc engine, five-speed gearbox and manual, motorcycle-style clutch with long-travel suspension and sporty chassis geometry that was more at home ripping up race tracks than handling farm chores. Meanwhile, back at the ranch, building ATVs to endure the stress of utility use put Honda R&D on a steep learning curve. Approaching the mid-'80s, ATVs were inspected, dissected and exhaustively scrutinized with more data acquisition equipment than any other Honda product. Machines were run hour after hour, day after day for weeks, with riders wearing 50-pound instrument packs that recorded information on every aspect of the machine's operation. As the market's swing toward utility continued, Honda's research made it clear that the next step in the ATV's evolution would be another wheel. Thus Honda's first four-wheel ATV, the TRX200, debuted in 1984. The market responded almost immediately, making 1984 Honda's biggest sales year for ATVs. The 370,000 units delivered in 1984 remain the high-water mark for Honda ATV sales, making up a full 69 percent of total ATV sales in the U.S. that year. The upswing in utility use and the introduction of the four-wheel TRX200 were also the beginning of the end for Takeuchi's three-wheel matrix. Four-wheelers were considered more versatile tools by customers, and tools were what people wanted most. By 1986 the smart money was all on four wheels in the ATV world. The ground-breaking Honda TRX250R made an unmatched four-wheel performance statement with a liquid-cooled 246cc two-stroke engine similar to the ATC250R's. On the utilitarian end of the spectrum, Honda unveiled the first four-wheel-drive ATV that same year. The FourTrax(TM); 350 4x4 arrived at its coming out party in grand style-lowered from a helicopter to show all four wheels moving under their own power. Market forces were already at work to replace three wheels with four. Nevertheless, on April 28, 1988, the U.S. ATV distributors entered into an unprecedented 10-year agreement with the CPSC called the Final Consent Decree. Under the agreement, the ATV industry made a $100-million commitment to expand existing safety programs. Among the many components of this agreement, free training and training incentives were offered to owners and purchasers of new ATVs. Additionally, distributors would no longer market three-wheel ATVs, repurchasing any unsold three-wheel models from dealer inventory. Although three-wheel ATV sales were trailing off across the board at the time, and Honda had already introduced a line of four-wheel ATVs, the CPSC agreement did serve to accelerate the process. On the eve of the '90s, Honda introduced the 1988 FourTrax 300 and FourTrax 300 4x4, the revolutionary pair of hard-working Hondas that would ultimately become the most versatile, most popular ATVs in history. Combining an ideal balance of size, weight, power and capacity, the 300s sold more than 530,000 units over the ensuing 12 years. Powered by a 282cc air-cooled four-stroke single-cylinder engine, the FourTrax 300 sent its 20 horsepower through a five-speed transmission, automatic clutch and maintenance-free shaft drive. An ultra-low first gear helped it tow up to 850 pounds. Tough steel racks let it carry up to 66 pounds in front and 132 pounds in the rear. And if the hardest-working ATV in America ended up packing tackle to your favorite bass fishing spot on Saturday morning, nobody else had to know. Throughout the 1980s, more and more people saw the ATV as a vehicle capable of getting thousands of different jobs done faster and easier. By the time the '90s rolled in, the Honda FourTrax had become an essential part of the great American toolbox. You'd be hard pressed to find a Louisiana rice farm, Washington apple orchard or Montana cattle ranch that didn't have at least one. From copper mines to banana plantations, golf courses to pig farms, forest reclamation projects to shopping center maintenance, nothing on wheels had ever been as versatile, reliable, efficient and affordable, on the job or on the weekend, as the Honda ATV. Though sport models such as Honda's FourTrax 300EX and the new-for-'99 400EX are immensely popular with sport and recreational riders, industry observers estimate that 85 percent of ATV use in the '90s revolved around some sort of enterprise. Mr. Takeuchi's idea had grown up, gone to work and done a good job. When asked what products had the greatest impact on their farming operations since 1967, the readers of Farm Industry News ranked the Honda ATV right up there with Dekalb Biotype E Sorghum, A3127 Hybrid Soybeans and the Miller Electric Mig Welder as a Landmark Product of the last 25 years. That's high praise from one of the most brutally sensible groups of people on the planet. In America, having a FourTrax on the job makes a host of jobs more efficient. In countries without our infrastructure, manpower and financial resources, the Honda ATV's reliability and efficiency handle jobs that simply couldn't be done before. Folks on other parts of the planet were discovering what America had discovered a decade before, and began putting Honda ATVs to work, performing all manner of work that was either impossible, impractical or both. Whereas Honda ATVs were largely a domestic phenomenon before 1990, they're currently working in more than 35 different countries worldwide. The 1995 Foreman 400 4x4 introduced the working world to the strongest, most efficient Honda ATV yet. Powered by an innovative longitudinal engine design that positions the crankshaft perpendicular to its axles, the '95 Foreman's front and rear drive shafts transfer power to all four wheels with fewer power-robbing directional changes, fewer parts, less weight and a lower center of mass. In 1997 Honda introduced the advantages of its longitudinal power train to a broader circle of ATV users with the FourTrax Recon, a mid-size 2WD ATV that works hard and can scurry down a trail better than anything in its class. 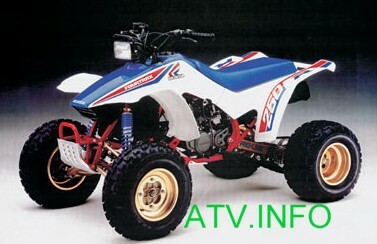 In 1998 Honda debuted its Electric Shift Program (ESP) on an all-new 450cc ATV, the Foreman ES. Combining the convenience of an automatic with the control of a manual gearbox, ESP allowed Foreman ES riders to shift up or down with push-button ease. Honda's meticulous approach means the only thing harder than building the toughest ATVs on earth is improving them. Improving the single most popular ATV model, the FourTrax 300 series, was a truly difficult undertaking. Moving into the new millennium, the Rancher lineup achieved just that. Putting the compact, powerful efficiency of the 329cc longitudinal-powered drive train in an all-new chassis creates a better version of what was arguably the most versatile multipurpose ATV ever created. Responding to a skyrocketing market's demands for even more hard-working horsepower and a true automatic transmission in an ATV with Honda innovation and durability, the 2001 Rubicon is introduced in the spring of 2000. The largest, most powerful multi-purpose Honda ATV ever is also the most innovative. Muscle from its liquid-cooled overhead-valve longitudinally mounted 500cc engine flows through an all-new, continuously variable Hondamatic transmission with enough original ideas inside to have more than 100 patents pending. One of Honda's greatest strengths has always been its ability to create all-new products that don't fit in existing categories-such as the original US90. Honda does it again with the 2003 FourTrax Rincon to create the world's most comfortable ATV. It features taut, modern SUV styling, Honda's largest-displacement ATV engine, plus liberal use of aluminum to reduce weight. Conversely, Honda has also easily expanded a product's versatility to satisfy a broader audience, and that's the case with the 2004 FourTrax Rancher AT/FourTrax Rancher AT GPSCAPE. An all-new longitudinally mounted 397cc OHV single, SUV-influenced styling, plus a smaller, more efficient Hondamatic automatic transmission with Electronic Shift Program and, on GPSCAPE models, an integrated GPS unit, only broaden the Ranchers' appeal as the world's best all-around ATVs.